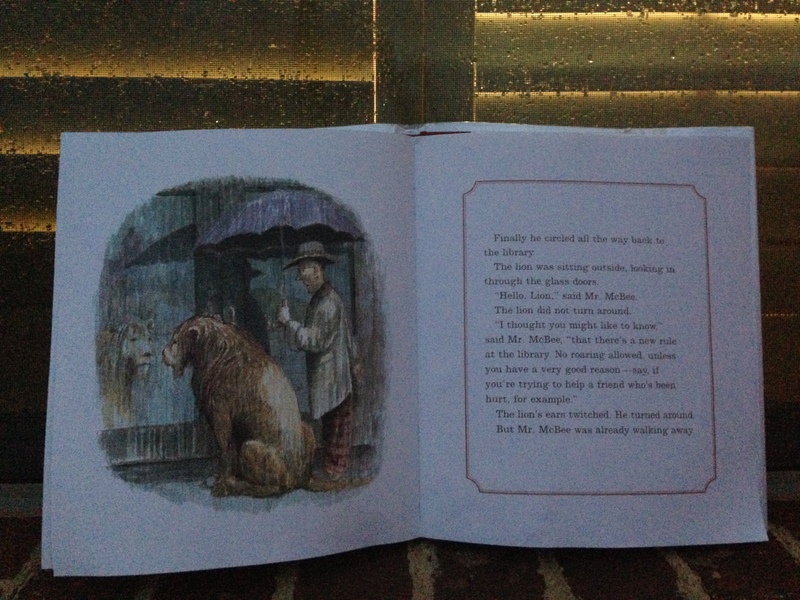 On a dark and rainy evening, Mr.McBee makes amends with the Lion.
. . . Mr. McBee decided to put his pride aside and make amends by finding the lion. Off he set in the dark and rain until he circled all the way back to the library where he found the lion looking longingly into the library. “‘Hello, Lion,’ said Mr. McBee. The lion did not turn around. The next day, Mr. McBee entered Miss Merriweather’s office. Now Miss Merriweather couldn’t help but break the rules too– she ran down the hall and joined the children in welcoming back their friend, the lion. Below is a FRIENDS list of activities for you to use with your audience. F How do you feel when you go to a library? Excited or restrained? Why? R How do you relate to the lion’s struggle of following the rules? I Imagine you could have any zoo animal come to your story time and be tame. Which one would you pick to join you and why? N Nagivate your surrounding cities and indentify local libraries. Go to a story time or activity at several different libraries, especially over the summer break. D Develop a list of the top three rules for your audience (classroom, home) and have the children tell you why those rules exist and give example scenarios of when they may be need to be broken. S Share this story with your librarian at your school or town by writing a thank you note including the title of the book and description of how he/she makes the library a special place for your family. Your librarian will appreciate this gesture! Now as an adult, I enjoy the library more than ever. Taking our kids to find books is like an opportunity to re-do this part of my childhood. I’m like a child at an amusement park wanting to ride everything, over and over again. We max out three library cards on each trip and renew our favorites over and over again. Our children get to see a “childlike mommy” being thrilled as we buckle down into a book together. Come and join us! What’s on the shelf in your library? 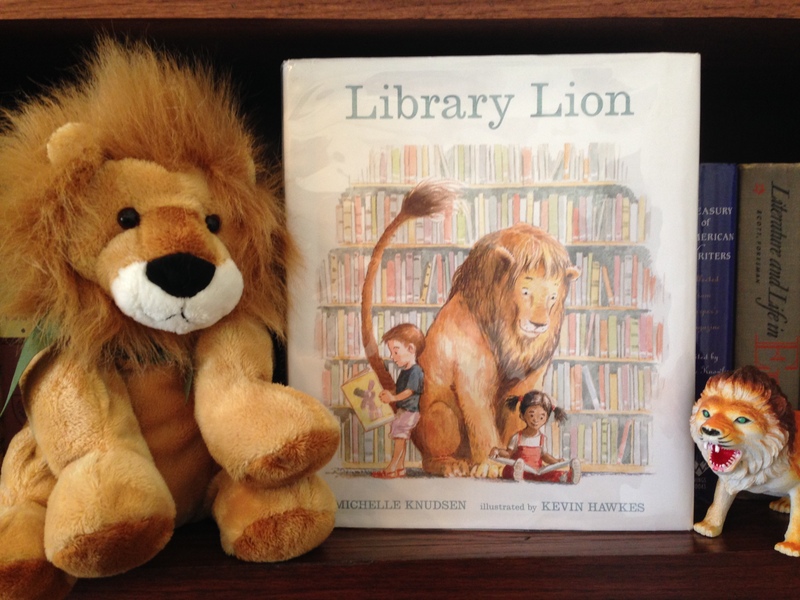 This entry was posted in library and tagged children's books, librarian, library, lion. Bookmark the permalink. You are not going to believe this but I don’t have this book in our library and I’ve never even read it! Shocking, I know! I will need to send an e-mail to the district Librarian, Ms. Rendon, to order it ASAP. (She orders all our books for the district). Rules should definitely be adapted and changed. We should never become so rigid that we aren’t able to come up with another solution for a problem. There are times that certain rules just “don’t work”. However, I have to admit that I am a little uncomfortable telling students that sometimes it’s okay to break the rules. I remember years ago, when my children were young, Burger King had a series of commercials and the tag line was “sometimes, you just gotta break the rules.” As a young mother, I worked hard to instill in my children to respect rules, even if they seem unfair. This really bothered me and I used the time when the commercial came on to talk to them about respecting rules. Maybe it’s just a matter of wording 🙂 I really need to read that book! Something that we are starting to implement in our library is more student ownership and responsibility. I have started a program for the 4th grade called “Adopt a Shelf”. The student’s sign up to be a part of the program and then I assign them a shelf in the library. When they come to the library they are responsible for straightening up their shelf. If they have time, they may straighten up an “orphan” shelf that has not been adopted. I’m hoping that this will give them more pride and a sense of ownership about the library. I believe this will help alleviate the need to have so many rules. I am also in the process of starting a self check out system to give them more responsibility. I love how the picture in the book matches the rain on the window sill in the background. Makes me want to grab a cup of hot chocolate or tea by the fireside !